Learn how to massage your baby to deal with everyday issues! ​Are you a parent struggling with calming your infant, alleviating gas/colic, or improving their immune function? Come learn how daily infant massage addresses all of these and more! This 4-class series is for parents/caregivers to learn over 40 strokes to help address common issues in infants. Khyati Desai-Seltzer is a Certified Infant Massage Instructor through Infant Massage USA and through the International Association of Infant Massage. Infant Massage is an ancient practice of massaging your baby that leads to significant emotional, physical, physiological, and mental benefits. 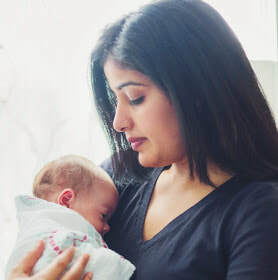 Khyati offers instructional classes to parents and caregivers of infants 4 weeks to pre-crawling through private individual, group, or private group classes. Some of the benefits include improved elimination, improved sleep, better immunity, circulation and more! Khyati has a BA in Sociology and International Studies and an MA in Public Administration in Nonprofit Management. She lives with her 3 year old daughter and husband in Arlington and loves yoga, meditation, traveling, dancing, and time with family and friends.